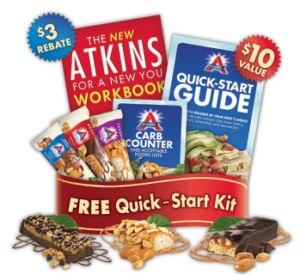 If you have been wanting to try the Atkins program then check out this freebie, a FREE Atkins Starter Kit which includes a Quick-Start Guide, Atkins Carb Counter, a New You Workbook and 3 FREE Atkins Bars. Head on over here to sign up and request yours. Please note: There is no obligation to buy anything. This offer is limited to U.S. residents only. Limit one kit per household per year while quantities last. anxious to receive this Quick-Start Guide . . .
i have seen the results of other atkins dieters. i hope i can be as successful. My friend has been on the Adkins diets has lost weight and I would like to try it too.